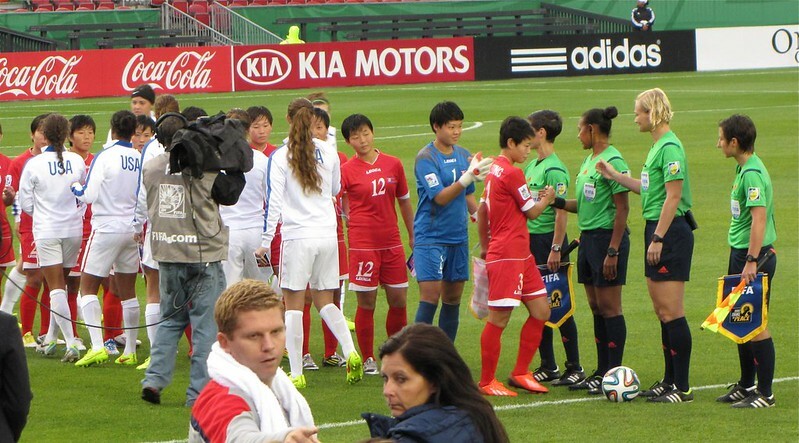 green tea: FIFA U-20 Women's World Cup in Toronto: North Korea vs. USA! 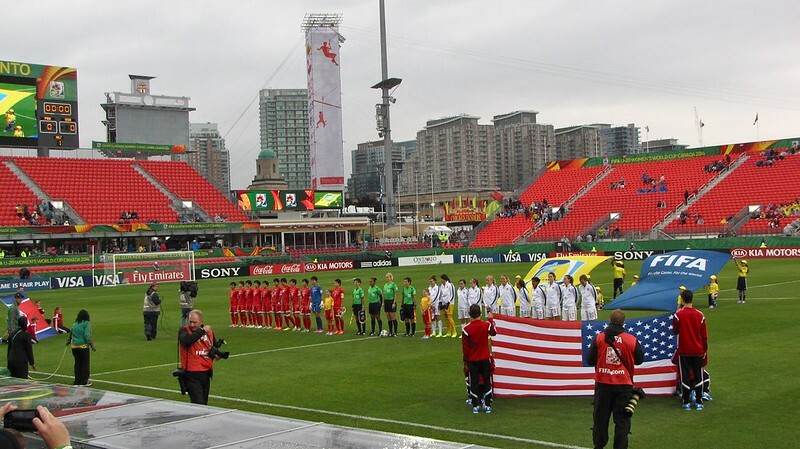 FIFA U-20 Women's World Cup in Toronto: North Korea vs. USA! 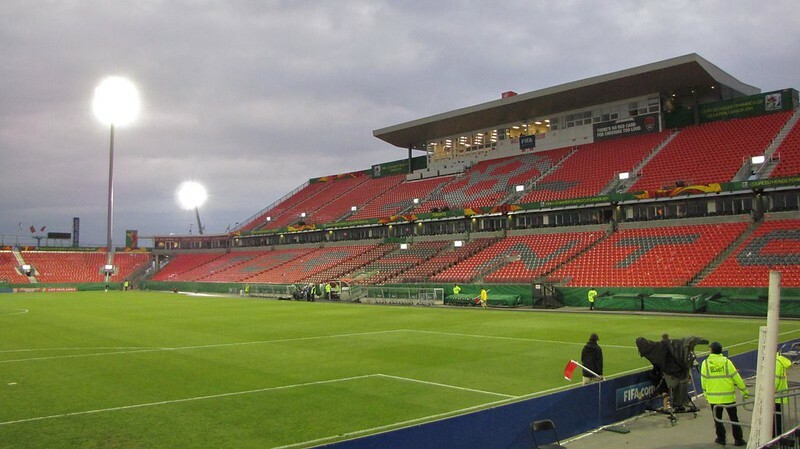 The FIFA Under 20 Women's World Cup is being played here in Canada this summer. 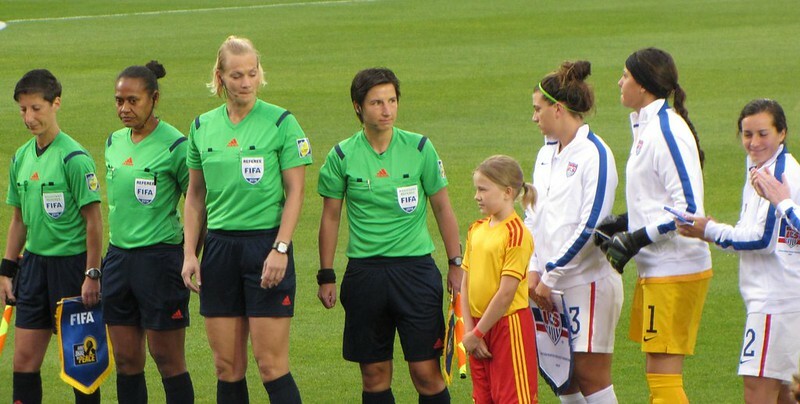 The rules of this tournament are just the same as the "big boys'" World Cup, except that the players are women aged 17 to 19. 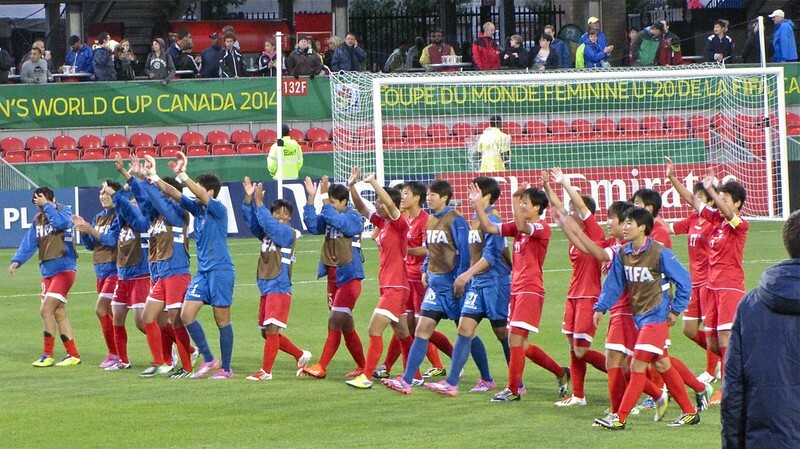 Sixteen teams qualified for the U20WWC. 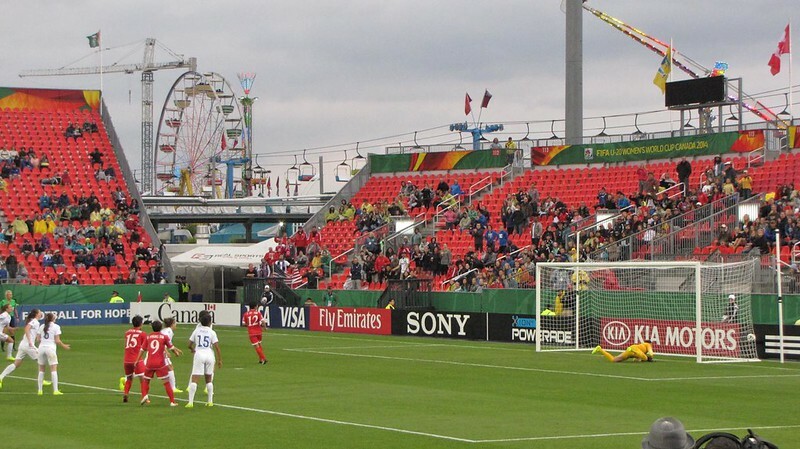 I have always wanted to attend a World Cup match and this one was played on a Saturday afternoon just a transit ride from my apartment. Perfect. It was a quarterfinal match so when I bought the tickets last month, we didn't know which teams we'd be seeing. 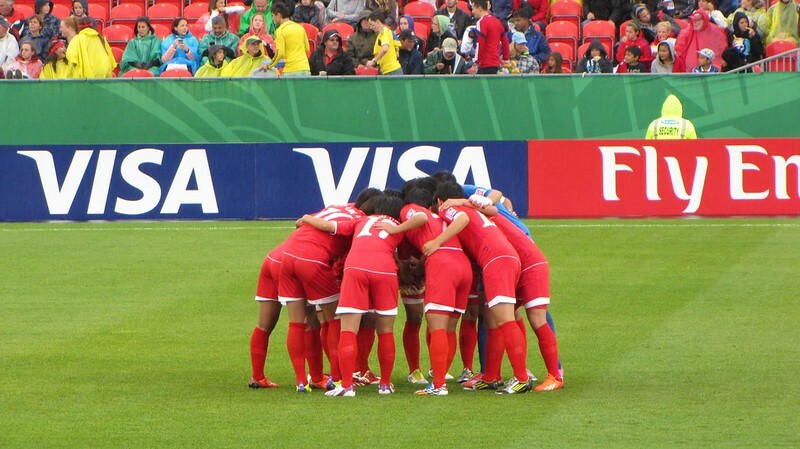 In the end, the opponents were USA versus the team variously referred to as North Korea/Korea DPR/PR Korea/PRK. It was a well-balanced pairing! 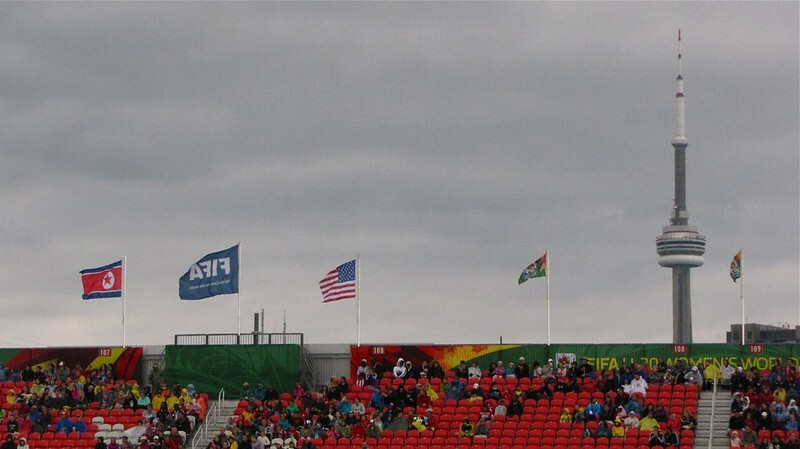 I brought my good zoom camera to the match, wrapped in a plastic bag against the rain. I think this is the first time I've used the 'sports' mode for photographing actual sports. North Korean anthem time. Their uniforms seem to include a team haircut. Very practical, ladies. Game on! Lots of excellent footwork on display for both sides. 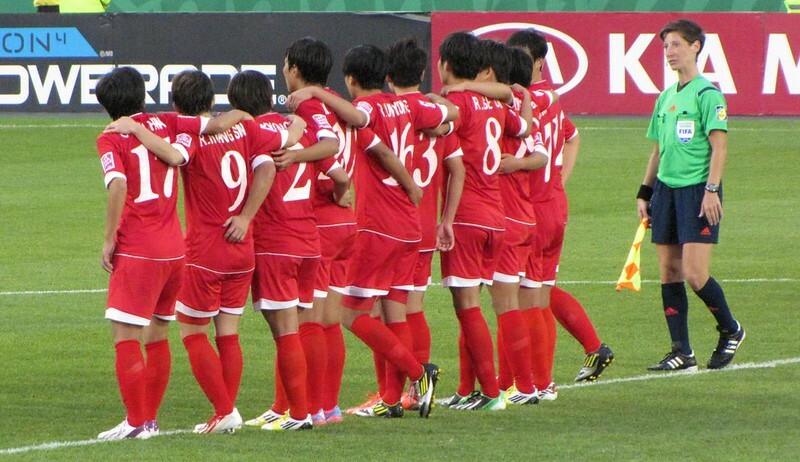 The North Koreans seemed to have more cohesive teamwork, though. 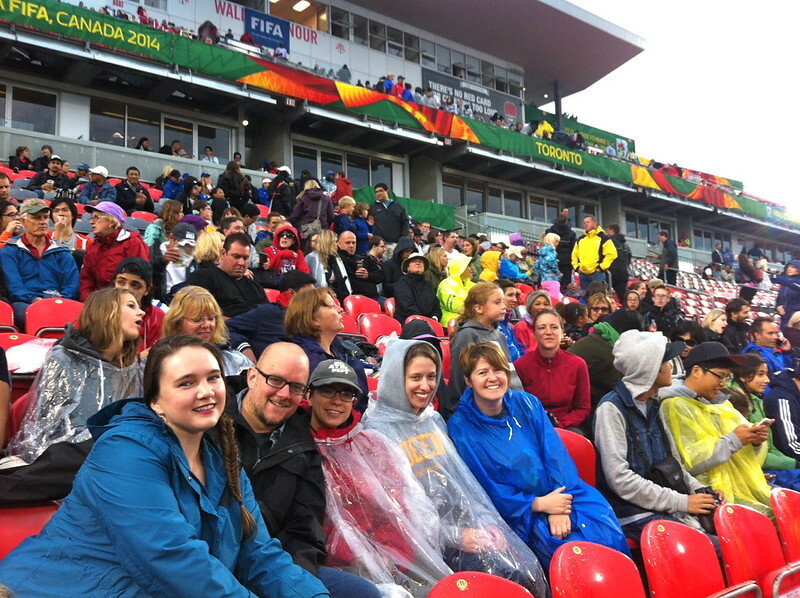 It was raining throughout the first half. 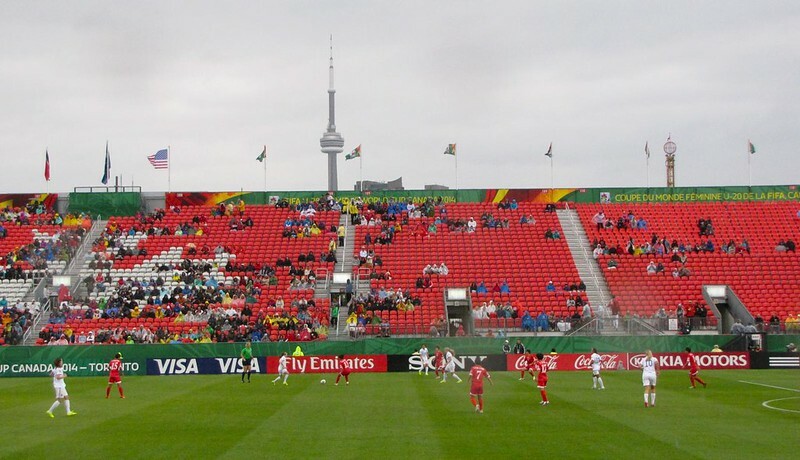 The stands look a little empty but attendance was 7,200. More people were sitting on our side of the stadium. 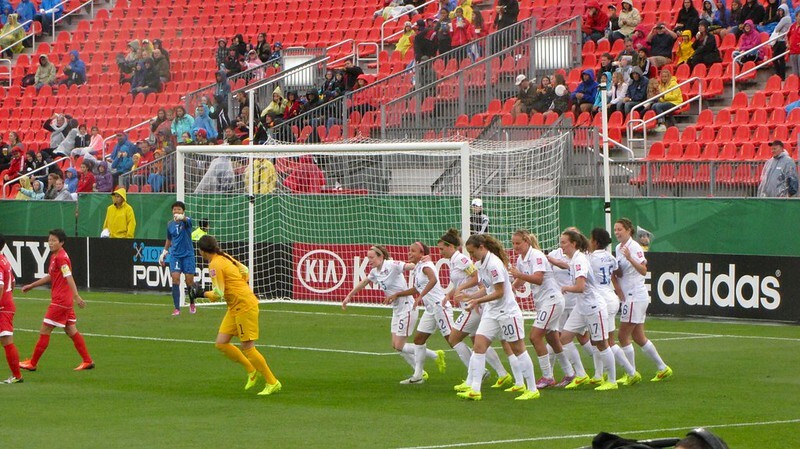 USA celebrates Mackenzey Doniak's goal at the six minute mark. 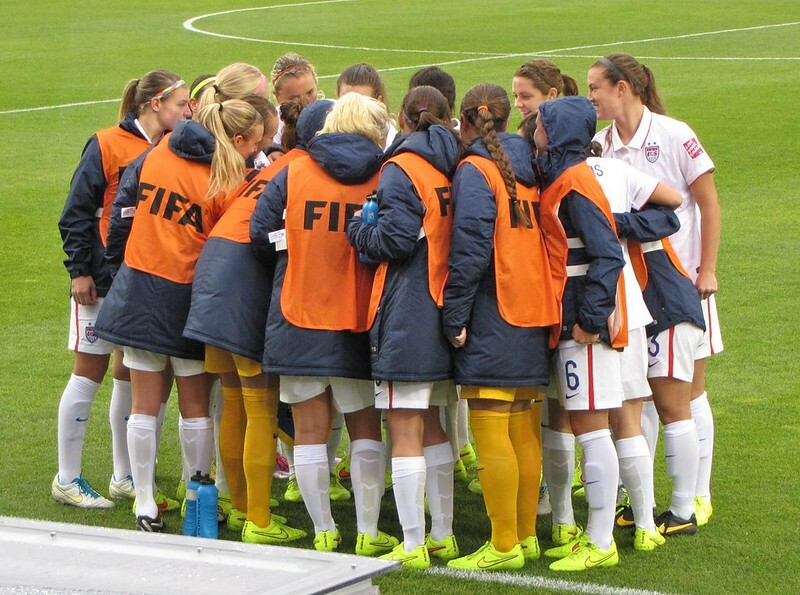 USA was up 1:0 at half time. 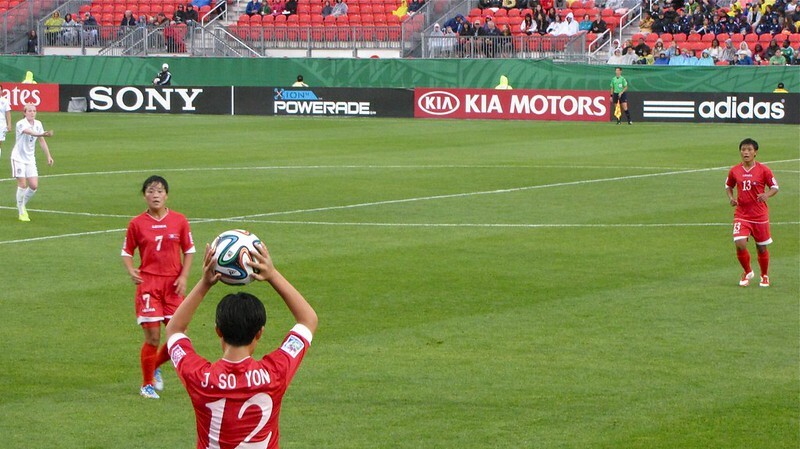 Jon Yo-Son scored with a penalty kick at 54 minutes. 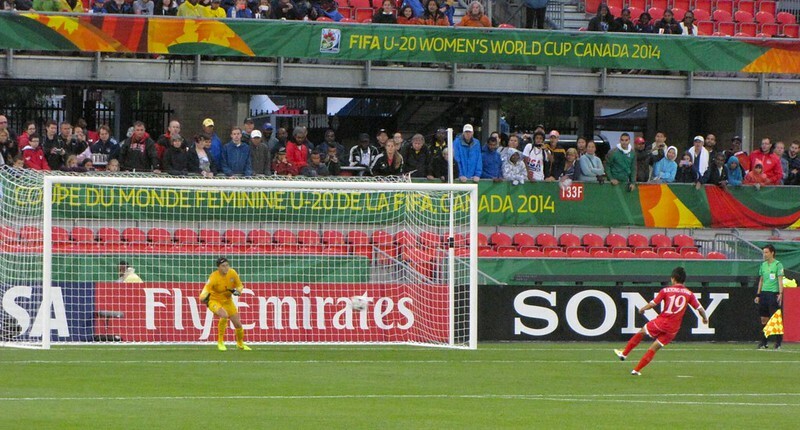 The ball is in the bottom right corner of the net. 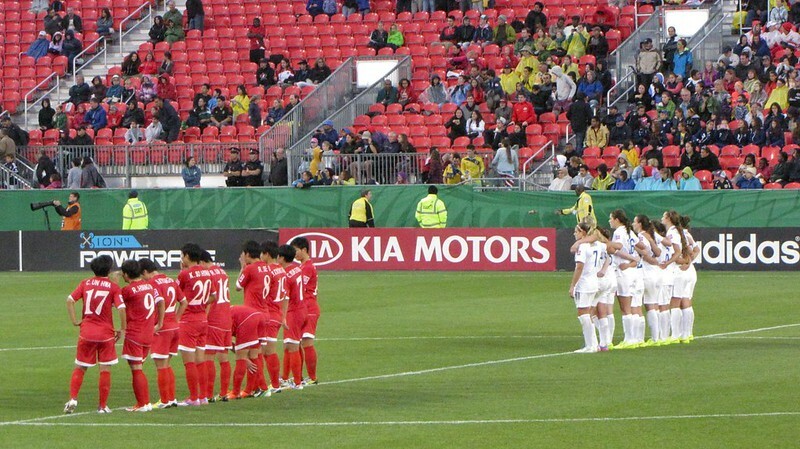 The score stayed at 1:1 through to 90 minutes and 30 minutes of overtime. 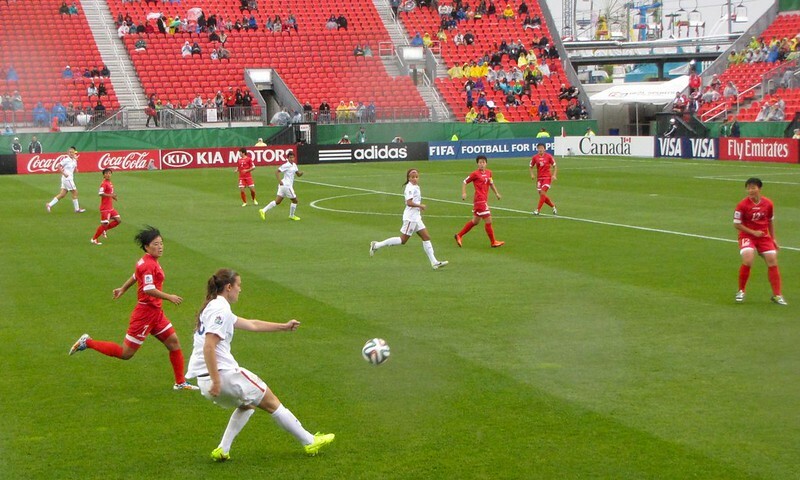 Lindsey Horan had a chance with this free kick but couldn't break the tie in overtime. 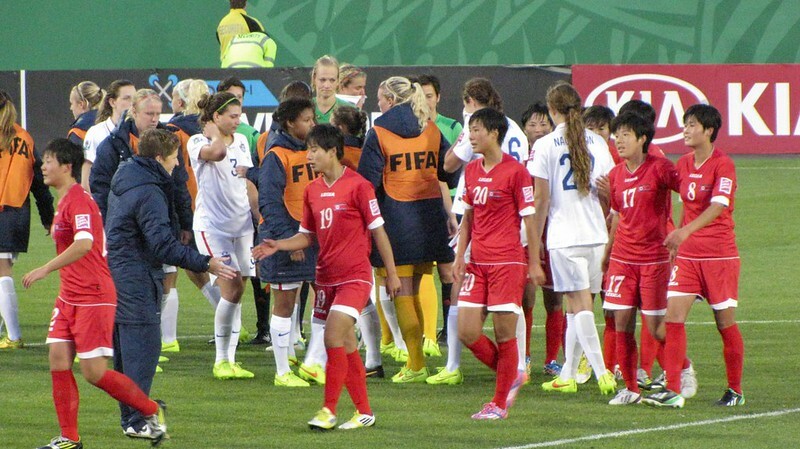 A very close match: possession was 51% North Korea and 49% USA. 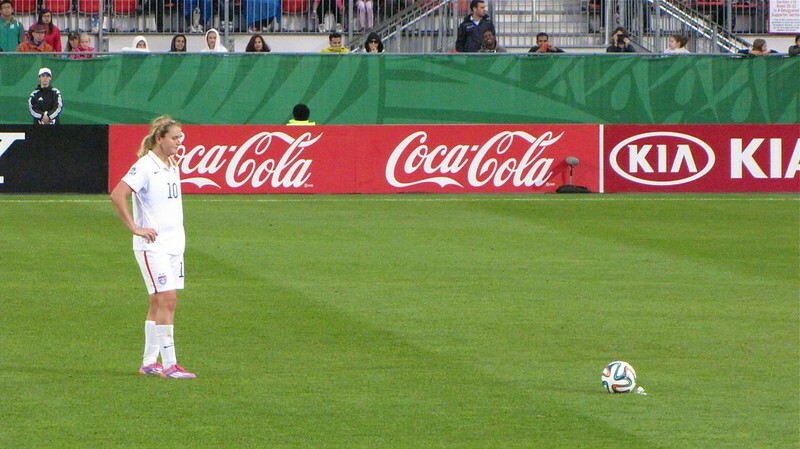 Now it was down to penalty kicks. 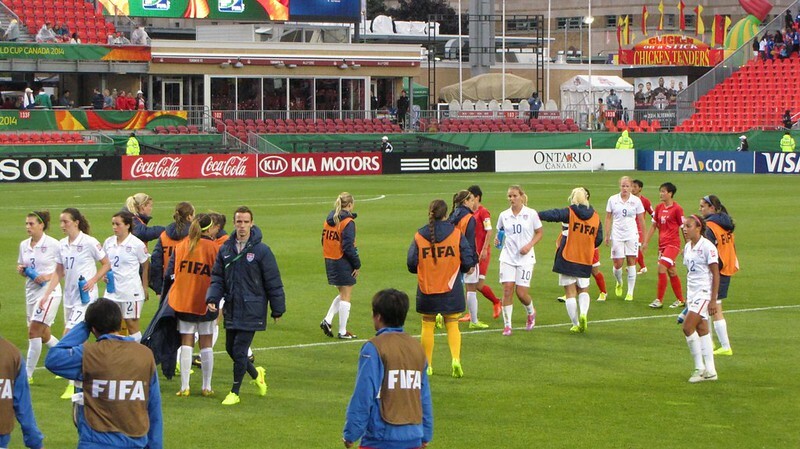 USA substitutes watch the tie-breaking penalty kicks. Waiting for penalty kicks to begin. 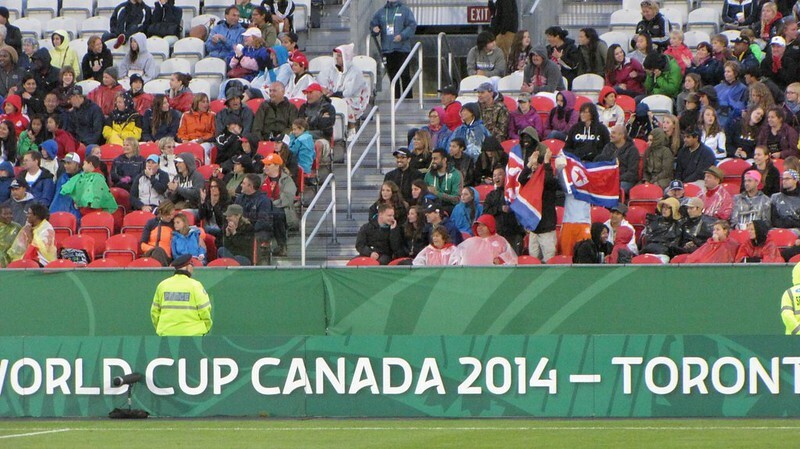 Some North Korean flags emerge from the crowd! 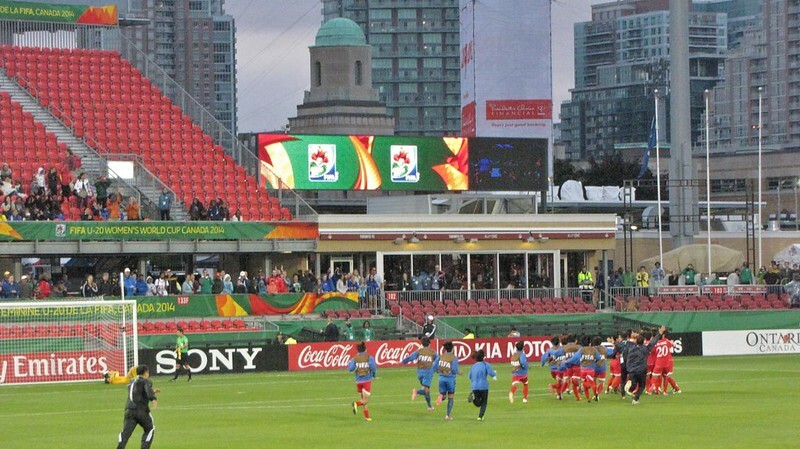 To be honest, I think many of the Canadian spectators were cheering for North Korea... 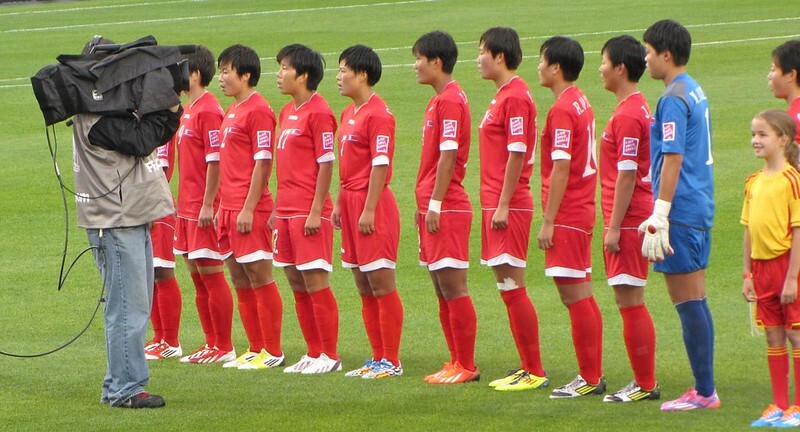 I confess I was favouring the reds, too, just because I suspect those ladies have had extremely tough lives training as athletes to represent North Korea. The winning moment for North Korea! 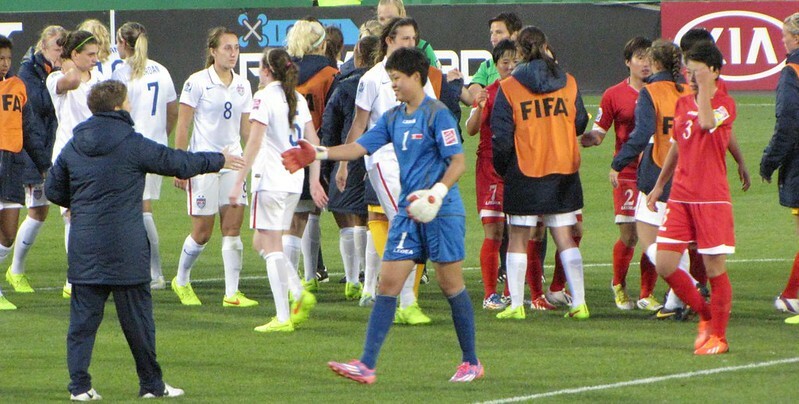 Kim Chol-Ok shakes hands with the US coach. The keeper was voted Player of the Match. Some long faces on the American players who were now eliminated from the tournament. 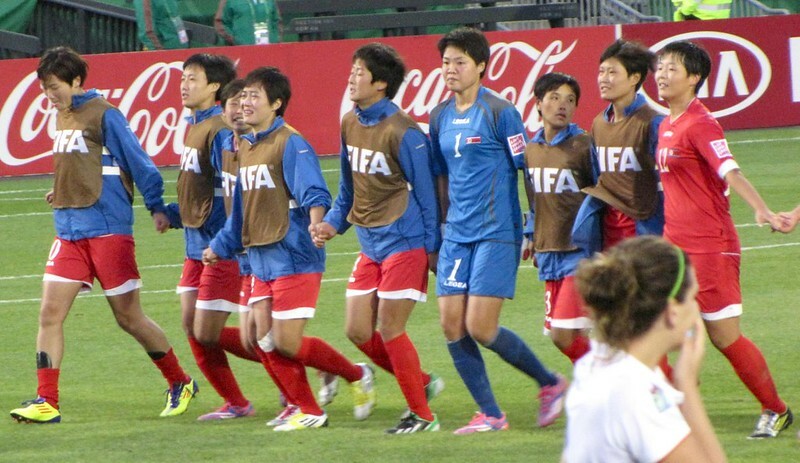 And a few tears of relief for the North Korean players, particularly the girl with the taped knee who had been taken off injured. Thanking the crowd for their support. We were undeniably damp but it was a good evening out with co-workers. 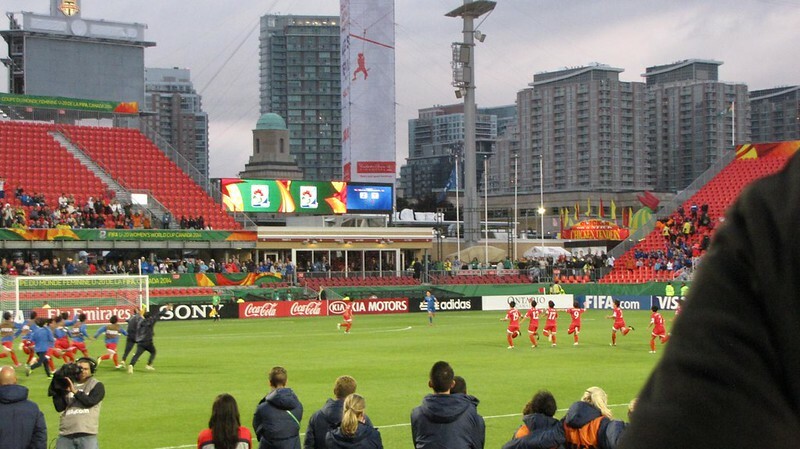 It's all over at BMO Field. 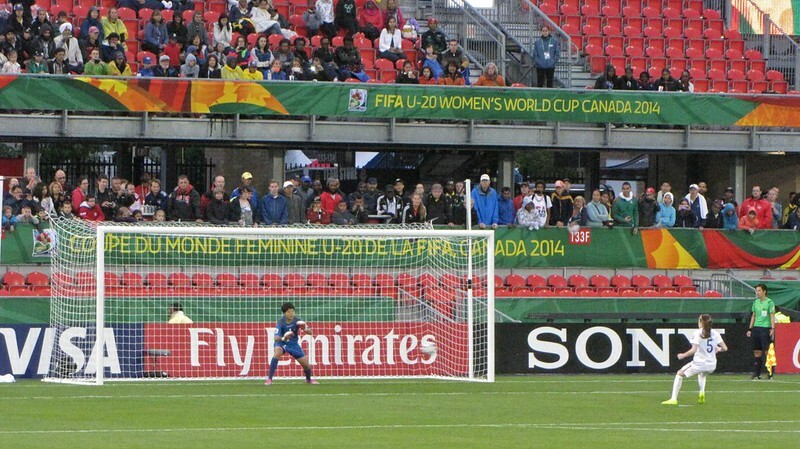 No more U20WWC matches in Toronto and sadly, none of the 2015 Women's World Cup matches will be played here, either. Official FIFA video recap here. Match report here. 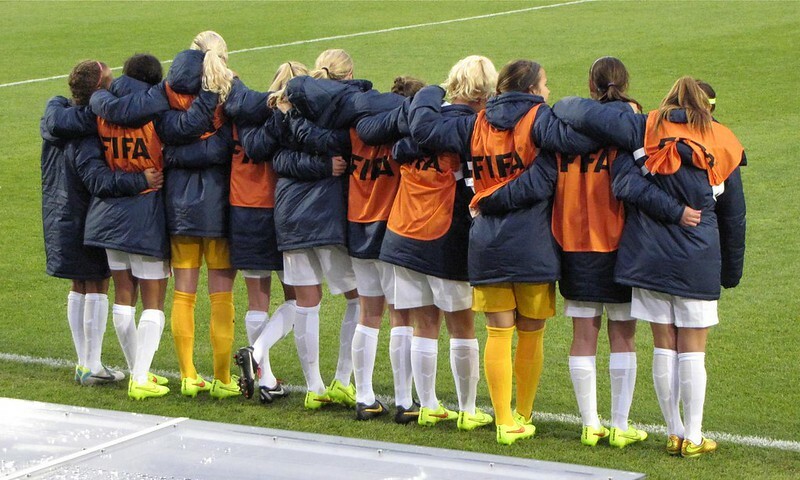 Four teams now remain in the tournament: North Korea, Germany, Nigeria and France. 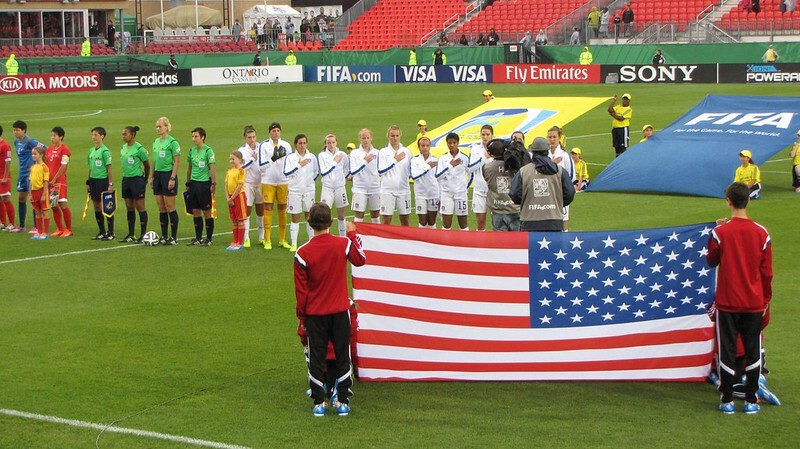 Follow the rest of the U20WWC here.